Sharpshooters must get permission to shoot deer near homes, MLive, Dec 24, 2-15City officials have said shooting would occur from deer blinds, with shots fired downward toward the ground, within an identified list of nearly two dozen city parks and nature areas, a list refined by the City Council this week. U of M Professor Calls Ann Arbor Deer Cull “Gun Violence”, Deer Michigan, Dec 8, 2015Hunting isn’t “violence.” Hunting or even culling deer with firearms is not “gun violence,” any more than bowhunting is “bow violence,” or earlier hunting was “atlatl violence,” “spear violence,” or “rock violence.” Hunting is hunting. It’s how our species and the ancestors to our species have been obtaining meat for two million years. You’d think an anthropology professor would know that. Ann Arbor council votes 7-3 to scale back park closures for deer cull, MLive, Dec 21, 2015Collins explained the city’s decision to close parks starting at 4 p.m., saying that hour of daylight before 5 p.m. is important from a safety standpoint in making sure parks are cleared and also in terms of the effectiveness of the cull. Attempt to recall Ann Arbor council member fails, MLive, Dec 17, 2015The recall attempt comes after Westphal and nine other members of council voted in favor of a deer cull. Sanzotta said in the past that she would attempt to get any council member who voted for the cull recalled. Calling BS on “Stop the Shoot” Propaganda, Deer Michigan, Dec 9, 2015Make no mistake: the opposition to the deer cull in Ann Arbor is a pilot case. The arguments that the animal rights crowd is making here are the same ones that they’ll use to go after deer hunting where you live if they’re successful. They would much rather inject drugs into deer and let them get hit by cars than let you hunt and eat them, or donate the venison to food pantries. Ann Arbor OKs controversial winter deer cull, Detroit Free Press, Nov 6, 2015Ann Arbor officials have decided to allow sharpshooters to cull deer on public land this winter. Ann Arbor council votes 10-1 to hire sharpshooters to kill deer in city parks, MLive, Nov 6, 2015In two separate 10-1 votes Thursday night, the City Council took action to move forward with a cull to address concerns about deer overpopulation. Ann Arbor police called to put down 2 deer Tuesday, MLive, Nov 4, 2015Ann Arbor police handled two different calls to residential areas to put down deer on Tuesday. Petersen clarifies position on Ann Arbor deer cull at latest City Council candidate forum, MLive, Oct 12, 2015“I want to clarify that any opposition I have to the cull is merely a personal one,” said Petersen, who has stated she would prefer using nonlethal methods to control the deer population. Frederick County Shotgun Deer Hunting Zone has Changed, Maryland Dept of Natural Resouces, Oct 15, 2015The previous shotgun-only zone was primarily located south of Interstate 70 and did not include the city of Frederick or surrounding area. The new zone is now centered around the city, and the more rural portions of the county south of Interstate 70 are no longer in the shotgun-only deer hunting zone. Humane Society of Huron Valley wants to stop Ann Arbor deer cull , Michigan Public Radio, Oct 15, 2015City Councilmembers are “disappointed” by the misinformation being disseminated by the campaign.Westphal praised city staff who conducted deer population aerial surveys and researched non-lethal means of controlling deer populations in cities. That research convinced him and others on the council that a cull is the only solution, although the council has also agreed to consider participating in a pilot project trying non-lethal methods. Humane Society’s campaign against deer cull brings contract funding into question, MLive, Oct 11, 2015Westphal said he’s tired of what he views as “fear mongering” coming from the Humane Society. “What’s frustrating is that they are disseminating false information locally, which is confusing citizens and costing council and staff a significant amount of time, which could be more productively used,” he said. Ann Arbor City Council approves 100-deer cull on public land this winter, ClickonDetroit.com, Nov 6, 2015Ann Arbor officials have decided to allow sharpshooters to cull deer on public land this winter. Candidates divided on Ann Arbor’s sidewalk snow-removal rules, MLive, Oct 7, 2015Lumm noted the plan to hire sharpshooters came from the city’s administration, and everyone on council except the mayor supports it. She emphasized the plan was developed with a lot of community input. She acknowledged there were some concerns about an online survey the city used to gauge citizen support for culling. The survey, which was criticized as biased, repeatedly stated that lethal methods are proven to be the most effective option for managing deer, before asking residents whether they supported lethal methods. Ann Arbor marijuana advocate worried people smoking pot in parks could be shot during deer cull, MLive, Oct 6, 2015Warpehoski said he took Gholson’s threats seriously. As he spoke Monday night, he said he was using it as a teaching moment.”I think what she was thinking was that, when I saw people with guns outside my house, it would make me realize why the cull was a bad idea,” he said. “But for me, this is a teaching moment. What is the difference between an open-carry protest and a cull? In a cull, we work with highly trained, highly vetted people who observe very rigorous standards for safety and site selection to carry out that activity. “In an open-carry protest, we don’t know who’s there, we don’t know how they were trained, and they just show up.” Furthermore, Warpehoski said, the sharpshooters hired to conduct a cull go to great lengths to avoid being noticed. Ann Arbor deer cull controversy becomes election issue in 2nd Ward, MLive, Oct 1, 2015“After studying all the research, and there is a vast array of research on this topic, the only feasible, proven option to address the overpopulation issue in a free-ranging herd was to have an annual cull at this point,” Lumm said. “As we start to reduce the deer density, other management options will become more viable, but right now other nonlethal methods are costly, experimental and not proven.””It is my understanding that the two current council members from each of the five wards support the plan for lethal deer management to begin in 2016, so there is an obvious consensus in city government on this issue despite the mayor’s caution to acknowledge this,” Banet said this week. Non-Lethal Weapon: HSUS’s Failed Deer Fertility Control Plan, Protect the Harvest, Sept 2, 2015The HSUS representatives, after surveying the land and deer patterns [in Ann Arbor], claim that they can effectively sterilize around 65% of the doe population and in the very best of circumstances 85%. When you are talking about hundreds of deer this is, even in the ideal scenario, far below the 95% needed in an urban area as determined by the Cornell study. Yet, the representatives said that this low percentage should be enough to impact the population. You know, because they said so… that’s good enough right? How will Ann Arbor carry out deer culling? City officials explain process, MLive, Aug 25, 2015Specific cull program details, including location, public notifications and specific safety measures taken, will be developed in coordination with the selected sharpshooting contractor, city officials said. It’s expected the culls will take place in city wards 1 and 2, which include the north and east sides of the city [on city property]. The DNR special permit requires the deer to be processed and the venison donated to a local food bank. Eckert: University town does the smart thing, Times Herald, Aug 20, 2015Most communities reject the sterilization option because it’s expensive at $1,200 or more per animal. Each doe is live-trapped and surgically neutered, a not simple or inexpensive project.Officials in East Hampton Village, New York, are facing tougher questions than that. There, local activists raised a big bundle of cash and convinced officials to begin a deer sterilization program to fix the village’s white-tail problem. A nonprofit group dropped 114 does with tranquilizer darts and delivered them to veterinarians for neutering. Then the neighbors started finding dead and dying deer — ones with ear tags identifying them as participants in East Hampton Village’s morbid experiment on “nonlethal” deer control. One sterilized doe was pregnant with twins when it died of septic shock. Others died of abdominal infections caused by sloppy surgery. Ann Arbor council votes 8-1 to approve controversial deer cull, Mlive, Aug 17, 2015After more than a year of serious discussions about starting a deer management program, the City Council voted 8-1 early Tuesday morning in favor of a lethal approach, while keeping an open mind about continuing to explore deer fertility control as a future option. Ann Arbor council OKs deer culling measures, Click on Detroit, Aug 17, 2015Interesting coverage- Got it a little wrong. See Discussion on option A and C from Aug 17 at http://a2govtv.pegcentral.com/player.php?video=e372bdf4834ca8fe83901fbf36f0e979 starting at 5:19:45. Animal rights groups challenging Ann Arbor deer cull ahead of council vote tonight, MLive, Aug 17, 2015A Southfield-based group called Michigan’s Political Action Committee for Animals is opposing culling deer in Ann Arbor. Michigan DNR: 3rd deer has brain-attacking disease, Detroit Free Press, Aug 6, 2015A third free-ranging deer from Meridian Township near Lansing has tested positive for chronic wasting disease. DNR wildlife veterinarian Steve Schmitt says hunters should have their deer checked and tested to help determine the spread of the contagious, fatal disease that attacks the brains of infected deer and elk. Don’t Let HSUS Artificially Alter Ann Arbor Deer, Deer Michigan, July 14, 2015HSUS’s solution to artificially sterilize Ann Arbor deer is an unnatural alteration and a waste of free-ranging wildlife belonging to the people of the State of Michigan and managed in trust for us by the professional biologists at the Department of Natural Resources. For all the talk of “Ann Arbor values,” it’s shocking that this city, with a vibrant ecological and environmental community, surrounded by and containing numerous natural areas, would even consider a solution as unnatural as artificially altering the biology of free-ranging wildlife in our community. It points to a fundamental disconnect between people and nature that they don’t understand the interplay of predator-prey relationships in an ecological niche and that humans are a part of that system, not separate and distinct from it. Ann Arbor officials expected to make a decision on deer culling by next month, MLive, July 14, 2015She said what makes Ann Arbor different is it’s an open system, as opposed to a closed system. She also acknowledged the Humane Society has never done a deer fertility control project in a community as large as Ann Arbor. East Lansing may have deer strategy by mid-summer, Lansing State Journal, June 7, 2015The deer really are a problem. “They have been a problem for us, and it seems like they are becoming more of a problem for everyone.” While she’s anti-hunting in general, Walton said “I’ve come to understand the need for it.”As state-sanctioned sharpshooters began killing deer in neighboring Meridian Township last week after the state’s first confirmed case of a wild deer with chronic wasting disease was discovered there, city staff are evaluating overpopulation, including “lethal” measures. Those could include archery or firearms. Chronic Wasting Disease found in Michigan deer, DNR activating emergency response, MLIVE, May 26, 2015The disease is transmitted through infectious, self-multiplying proteins known as prions. They’re contained in saliva and other body fluids of infected animals. In addition, soil can be contaminated by those body fluids. An animal can live with CWD, and spread it, for years. Affected animals may display abnormal behaviors like weight loss and physical debilitation. There is no cure; the disease is deadly. Michigan confirms first case of CWD in free-ranging white-tailed deer, Michigan DNR sent this bulletin at 05/26/2015 02:01 PM EDT:Press ReleaseThe Michigan departments of Natural Resources (DNR) and Agriculture and Rural Development (MDARD) today confirmed that a free-ranging deer in Meridian Township (Ingham County) has tested positive for chronic wasting disease (CWD), a fatal neurological disease that affects white-tailed deer, mule deer, elk and moose. This is the first time the disease has been found in Michigan’s free-ranging deer population. The disease is caused by the transmission of infectious, self-multiplying proteins (prions) contained in saliva and other body fluids of infected animals. Susceptible animals can acquire CWD by direct exposure to these fluids or from environments contaminated with these fluids or the carcass of a diseased animal. Once contaminated, research shows that soil can remain a source of infection for long periods of time, making CWD a particularly difficult disease to eradicate. Some chronically CWD-infected animals will display abnormal behaviors, progressive weight loss and physical debilitation. There is no cure; once a deer is infected with CWD, it will die. Michigan deer face potential deadly threat of chronic wasting disease, Michigan Radio, May 26, 2015State wildlife officials admit they don’t know where the deer in Meridian Township may have contracted the disease. Genetic testing suggests the deer is from the local area. And it may not be alone. Humane Society to assess potential for deer fertility control in Ann Arbor, MLive, May 25, 2015the Humane Society of the United States is now being invited to travel to Ann Arbor to assess the feasibility for conducting a deer fertility control research project here. Be sure to note the comments. In Michigan, Lyme Disease is an Emerging Summer Health Danger, Ann Arbor Independent, May 22, 2015Perform daily tick checks. Always check for ticks after being outdoors, even in your own yard. Ticks must usually be attached for at least a day before they can transmit the bacteria that cause Lyme disease, so early removal can reduce the risk of infection. Humane Society lobbying for fertility control instead of shooting deer in Ann Arbor, MLive, May 17, 2015The city’s staff has concluded the deer issues in wards 1 and 2 in Ann Arbor are too large and significant for a costly, experimental and unapproved deer management program like birth control to be explored. City to hold final meeting on Ann Arbor deer issue before report goes to council, Mlive, April 10, 2015Ann Arbor officials are inviting members of the public to attend a third public meeting to discuss options for managing the city’s deer population. About 40 deer killed at Ella Sharp Park during eighth annual deer cull, MLive, March 6, 2015The practice had sharpshooters bag 37 deer and one coyote over four weekends from January to February. Department of Natural Resources officials permitted animal control officers to kill up to 60 deer this season, and an unlimited number of coyotes. See and share photos of deer in neighborhoods throughout Ann Arbor, MLive, Feb 20, 2015What’s been your experience with deer in Ann Arbor? Share your thoughts in the comments below. City conducts helicopter flyover to count Ann Arbor’s deer population, MLive, Feb 13, 2015The city intends to use data from the survey, which is not yet publicly available, to establish a baseline deer population count to assist in the development of a deer management plan. Ann Arbor looking at ways to control deer population, ClickonDetroit.com, Feb 5, 2015Ann Arbor officials are inviting residents to attend a second hearing to address lethal and non-lethal ways of controlling the overpopulation of deer in the area. Our Deer Are Mostly Ann Arborites, Margaret A. Leary, Ann Arbor Observer, Jan 2015Herds now live permanently on the U-M’s North Campus and in the Arboretum, and individual deer have been spotted everywhere from Water Hill to Burns Park. “The great majority of deer you see in the City were born here—they are mostly Ann Arborites,” WC4EB member and landscape architect Chris Graham wrote in an email to the group. “It is our habitat full of food, cover, and no hunting that is immensely appealing and nurturing for them. The public meeting will include a review of survey highlights, a Q&A with a staff member from the City of Rochester Hills regarding that city’s experience implementing a nonlethal deer management plan. Members of the Washtenaw Citizens for Ecological Balance will present a deer management plan that includes lethal methods. Biologist tells Ann Arbor officials success can be had with non-lethal deer management plan, Feb 6, 2015“The feeding ban, which I think is critical — it stops deer from traveling in patterns that they might not otherwise travel,” he added. “We have an extensive sign program. 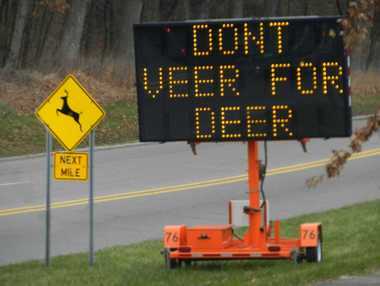 We looked at all the different roads that the deer were hit on, and we had Oakland County move our permanent yellow signs with the jumping deer on them.” Each fall, during high deer-vehicle crash months, Rochester Hills also puts out moveable message boards to high-crash areas, DeVoe said. Deer Killed In Clinton County May Have CWD, WILX.com, Dec 31, 2015Watertown Twp., Clinton Co. – The Michigan Department of Natural Resources says a deer killed by a bow hunter earlier this month may have Chronic Wasting Disease. DNR lauds partners in continuing battle against chronic wasting disease, Statewide DNR News, Dec 30, 2015Deer suspected positive for CWD found in Watertown Township; Jan. 12 public meeting set. Earlier this year, Michigan’s first case of CWD in free-ranging white-tailed deer was confirmed in Meridian Township in Ingham County. DNR: Deer killed in DeWitt Township may have chronic wasting disease, Lansing State Journal, Nov 13, 2015While DeWitt Township is one of nine townships that make up what the DNR has designated as the CWD Core Area, until now, no wild deer with the disease had been found outside Meridian Township. Deer disease has food banks on edge, Lansing State Journal, Nov 13, 2015All deer harvested within a nine-township core area around Meridian Township must be taken to a check station for testing. And processors who accept deer from the core area are required to isolate those carcasses from other meat. There were 5,557 vehicle-deer crashes in the six Southeast Michigan counties in 2014. For the five-year period 2010-14, Oakland County had the largest average with 1,761. Also, seven of the top 10 communities with the highest five-year averages are in Oakland County. Leading the way is Rochester Hills, which had a five-year average of 145 accidents. More Deer Venturing Out Of Woods, Into Urban Vistas, CBS Detroit, July 30, 2015The deer are venturing out into urban areas such as downtown Ferndale and even business parking lots in Southfield. Results of an aerial survey show the city’s deer population may have declined by nearly 20 percent over 2014. Results from a study by the Traffic Improvement Association of Michigan show there were more than 170 car-deer crashes last year, 97 percent of which resulting in only property damage. There were no severe injuries or fatalities as a result of the crashes. Deer culls stir debate in Detroit metro area, USA Today, March 6, 2015The DNR has authorized deer culls in recent years in Jackson, Grosse Ile, Hillsdale, Rochester Hills, and Oakland County parks, the DNR’s Payne said. State wildlife officials said deer culls generally are the only viable and legal option. Trapping and relocating the deer cause problems, Payne said. “It causes a lot of stress for the deer,” he said, and could spread disease.Payne said contraception and sterilization also are difficult and ineffective methods. The drugs on the market for deer contraception are not approved by the state of Michigan. How to control those deer overrunning Detroit suburbs?, Detroit Free Press, March 7, 2015A recent deer cull in Dearborn approved by the state has sparked a debate over how to deal with deer overpopulation in metro Detroit, where some residents are seeing an increase in deer. Deer cull completed at University of Michigan-Dearborn, Press and Guide, March 3, 2015Joe Robison, a wildlife expert from the Michigan DNR said the purpose of culling the herd is to make sure the animals stay health. “There are a lot of of deer out there, by creating a smaller population it will be healthier,” Robison said. Now that the cull is completed, meat from the deer will be processed and donated to Gleaner’s Food Bank, as well as Capuchin Soup Kitchen. Hunters kill deer at UM in Dearborn to control their population, Uncover Michigan, Feb 26, 2015“The deer populations are definitely getting larger in urban areas, there are no natural predators in this area and we’re not allowed to hunt. If not managed through a humane means like this, it will continue to grow and the deer will suffer consequences”, said Ken Kettenbeil, a university spokesman. Kettenbeil told The Detroit News that deer are being killed in a 300-acre environmental study area, which the university manages. An aerial study conducted last year showed 57 deer in the area; the number had grown to 76 in January 2015. There is also a physical danger which comes with the overpopulation. Deer related car accidents have increased in the Dearborn/Dearborn Heights area since 2013, and there is a potential concern that students could get ticks or Lyme disease from the animals. Hunters bag 14 deer during 1st night of Dearborn cull, Detroit Free Press, Feb 25, 2015The hunt was OK’d Monday night by Dearborn City Council, which voted 5-1 to approve it after previously deciding in December to hold off until the council members received more information. Last week, the Wayne County Commission voted unanimously to approve the hunt. Deer cull approved near University of Michigan-Dearborn, myFOXDetroit.com, Feb 25, 2015The deer are known to have darted into traffic or made their way onto campus, but officials say the bigger concern here is the risk of Lyme disease and ticks for the students touring campus and visiting the preserve area. .
School officials say no students are in danger during the cull, as the tree stands are in the back of the environmental area and not near the campus. The university is also on its Spring Break this week. Deer kill is under way at U-M in Dearborn, Detroit News, Feb 24, 2015Under contract with the university, the sharpshooters plan to reduce the deer population from 76 to about 20-25, said university spokesman Ken Kettenbeil. Scheduled Hunt Underway To Curb Deer Population Near U-M Dearborn, CBSDetroit, Feb 25, 2015There have been problems in the area with vehicle crashes involving deer. The recommended number of deer for the area is about five to 10. Sharpshooters Target 50 Deer on U-M Dearborn Campus, The Patch, Feb 24, 2015The first such cull in the university’s history began Tuesday and will continue until the deer population is thinned by about two-thirds. Oh, Deer! October, November is Biggest Car-Deer Crash Season, Motor & Equipment Manufacturers Association, Sept28, 2015Dan Shannon’s “Buck Pole” is just about ready to go up. The owner of Shannon Auto Collision has been putting it up every year — not to display deer carcasses — but rather the auto parts that died because of vehicle-deer crashes.According to the Michigan State Police, the state’s 2 million deer are most active during the spring and fall, but vehicle-deer crashes are a year-round problem. Locally, the majority of crashes take place in October and November. In 2014, Michigan motorists reported 45,690 vehicle-deer crashes. As a result of these accidents, 1,072 people were injured and six people were killed. All six of those who lost their lives were motorcycle riders. Deer wreaks havoc inside Mt. Clemens home, Detroit Free Press, Nov 4, 2015The bedroom of a 12-year-old girl is covered with feces, urine and blood from the six-point buck that was corralled in her room.A six-point buck, possibly 4 or 5 years old, jumped through the family’s front picture window and was eventually kicked in the head by Courtney’s older sister, Taylor, 17, before being corralled in Courtney’s room. Deer locked in bedroom after barging into Mt. Clemens home, ClickonDetroit.com, Nov 3, 2015The deer entered the house through the front picture window. It took off down the hallway and eventually barged into a bedroom, trampling over everything in its path and leaving blood all over the place. East Lansing considering deer kill, Lansing State Journal, Oct 1, 2015Officials appear ready to take stronger measures to thin out the deer population within city limits in light of the spread of chronic wasting disease in neighboring Meridian Township. Chronic Wasting Disease a new normal for deer hunters?, Lansing State Journal, Sept 2, 2015The glimmer of hope in all this is that the three deer that have tested positive so far were part of the same extended family, and all were found within a one-mile radius of the Haslett Road-Marsh Road intersection. Let’s hope that the problem is, indeed an isolated one, and that the DNR’s actions are not too late. live video stream on HOMTV’s website at www.homtv.net. DNR confirms third deer positive for CWD; hunter participation critical this fall, DNR Bulletin, Aug 6 2015“The good news is that all three deer came from the same small area.” Genetic analyses carried out by Michigan State University’s Molecular Ecology Laboratory indicate that all three positive animals were related as part of an extended family. Suburban location produced sick deer, Michigan Outdoor News, June18, 2015Corzine lives in a middle class subdivision in Ingham County’s Meridian Township with tree-lined paved streets, brick ranches and tri-level homes. Little did Corzine know that the loss of fear of humans was an early symptom of chronic wasting disease, a highly contagious and deadly disease that the deer was carrying. Chronic wasting disease is a contagious, always-fatal, neurological disease that affects cervids – deer, elk and moose. Midnight Snipers Fighting CWD, WJIMAM.com, May 27, 2015In the wake of Chronic Wasting Disease or CWD being confirmed in a wild Michigan deer, the Department of Natural Resources is moving quickly to implement an emergency plan it’s had for in place years but hoped to never use. The emergency management plan is aggressive and will likely change the dynamics of the deer population in the state for generations to come. How to control those suburban deer?, Lansing State Journal, March 7, 2015It’s a problem across metro Detroit as residents deal with deer, which number about 1.75 million statewide and cause damage to plants and yards and, in many cases, car accidents. There’s also concern among state officials that deer can spread Lyme disease through ticks. Meridian Township, Michigan Sees Suburban Deer Harvest Success, Wide Open Spaces, Feb 1, 2015In Meridian Township, Michigan, deer have been plaguing locals for years, causing roadway accidents, destroying yards and digging up gardens. Their numbers out of control. But the Michigan Department of Natural Resources began a program four years ago that has finally started to pay off, this year showing numbers in decreased auto-deer accidents. The deer harvest is a volunteer program and allows hunters to use bow and arrows only on a very specific schedule and allows them to keep one deer for themselves, and donate the rest to food banks. Last year over 1,500 pounds of venison was donated in the state. Meridian Township Deer Harvest, WLNS.com, Jan 13, 2015It is a managed harvest to control over-population. Some land owners have been matched with a hunter and between October and December, 150 deer were brought in. Official say the program was so successful it has been extended through February. food banks. Michigan Sportsmen Against Hunger generously provided funding for the processing fee, which lead to 1,500 pounds of venison donated through the program. A motorcyclist died after hitting a deer Friday night on Dearing Road in Jackson County.According to our media partner MLive, the man, whose name has not been released, was riding south near Springport Road just after 8:30 p.m. when he reportedly struck the deer. Sharpshooters cull 16 deer in Ella Sharp Park, on pace to bag 32 this season, MLive, Feb 7, 2015“The previous seven years have been successful with 515 deer harvested and more than 29,000 pounds of venison distributed to needy families in our community,” Hoover said to City Council before they voted in January to allow the cull. Roughly $5,500 was drawn from the Ella Sharp Park budget and added to the $2City officials hope to bring the deer population in the park to 15 per square mile, Ella Sharp Park Superintendent Eric Terrian said. The Michigan Department of Natural Resources approves permits for the city to allow for the deer cull.,760 promised by Summit Township for the eradication of deer and coyotes on park property this winter. Recap: Up to 60 deer could be culled at Ella Sharp Park this winter if Jackson City Council approves, MLive, Jan.13, 2015City officials hope to bring the deer population in the park to 15 per square mile, Ella Sharp Park Superintendent Eric Terrian said. The Michigan Department of Natural Resources approves permits for the city to allow for the deer cull. Cull allowed for eighth straight year in Jackson city limits in effort to control urban deer population, MLive, Jan 13, 2015 Jackson City Council voted unanimously Tuesday, Jan. 13, to allow for the eighth annual deer cull. “I guess the deer in Jackson just like the 6th Ward,” councilman Derek Dobies, 6th Ward, joked during the Jan. 13 meeting. “You can see that this program is working, as we’re allowed to harvest less and less deer every year.” Jackson County remains one of the worst in the state for car-deer crashes, according to data provided by the Michigan State Police. Deer smashes through window, runs over desk while employee works at Midland hospital, MLive, April 12, 2015The “wall of windows” next to her had a four-foot wide hole in it. She thought it may have been caused by a baseball until she exited her office and saw the deer going down the hallway. Brookens went back to her desk and saw glass and fur scattered in the area, calling security as she heard the deer “crashing into things” down the hall. The animal made its way out on its own through a set of double doors, about two minutes after it entered the building. She said the deer appeared to be unhurt. She said wildlife is not uncommon on the hospital campus, with walking paths and wooded areas. This is a first time a deer has been inside the building, she said. One man dead after two cars hit the same deer, WWMT.com, Dec 27, 2015Kalamazoo County Deputies said that one man is dead after two cars hit the same deer and one car hit a power pole on G Ave on Sunday. The deer smashed through the Buick’s windshield, causing the driver, a 32 -year-old from Battle Creek, to lose control, roll over, hit a power pole killing the driver. Lyme disease cases in Michigan increasing, WoodTV.com Grand Rapids, July 17, 2015In 2014, there were 30 reported cases of Lyme disease in Michigan. This year there has already been 48 cases in the state, according to the Kent County Health Department. Four cases have been reported in Kent County so far this year compared to five in 2014. However, health officials say in the past they have only seen one case a year. Lyme disease concern in West Michigan, Fox17online.com, April 27, 2015The Michigan Department of Health and Human Services has identified 18 counties in lower Michigan, including most counties in West Michigan, as having infected populations of ticks with Lyme disease. It’s caused by a bacteria that is transmitted by the tick when it bites.